In 1891, at the age of 63, Tolstoy compiled a list of those books which had particularly influenced him at different stages of his life. He emphasized that the list was incomplete and thus not for publication. I guess after 123 years all bets are off. Most of us are probably surprised to see the novels of George Eliot, Anthony Trollope and Mrs Henry Wood grouped together as “Great”. We’ve tended to sort them into this 1, 2, 3 order now. Shelf Awareness sends a link to this Brain Pickings item about the book list, written by Maria Popova. 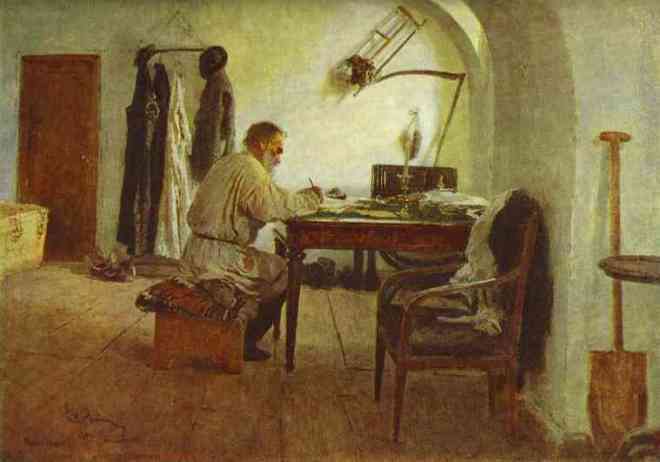 Here’s a link to a piece from Open Culture on an exhibition of Tolstoy’s manuscripts and drawings. If you click through the links on this page you’ll find more Tolstoyana, including a story about this same list of books, a recording of Tolstoy reading, a video of him late in life, and his family recipe for macaroni and cheese! Is there no limit to the information available to us via the World Wide Web? The Brain Pickings story gives a different (and more convincing) origin for this list of books. According to them it’s from a letter to a friend, reproduced in Volume 2 of Tolstoy’s Letters, edited by R. F. Christian.